This is my Tennis Ball Cannon. This may require a little explaining. When I was a kid, my Dad made a simple Tennis Ball Cannon out of a few soda cans and some duct tape. It worked great. He would blast the balls into the sky and I would try to catch them with a baseball mitt. 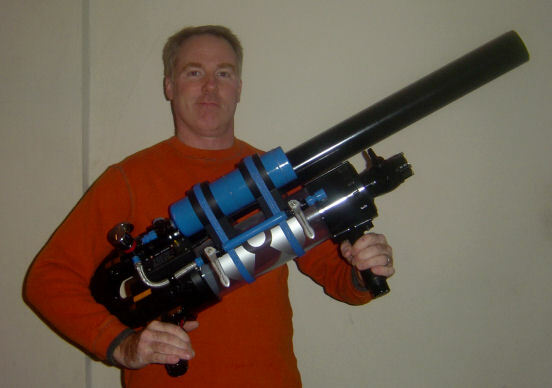 One day I decide to look up Tennis Ball Cannons on the internet, and boy had things changed. Most people shoot potatoes with them and refer to them as Spud Guns, whatever, same concept. Next thing I know I am reading all about what different people have done and the amazing evolution of this toy from years gone by. By this time I was obsessed. I had to build one. Based on what I had read, I knew I wasn't going to be able to build the biggest or the most powerful launcher ever, but I could make one that was more aesthetically pleasing (in other words "fly") and more functional than ever before. This is what I came up with.. Fully regulated & metered propane injection system that ensures a perfect 4% propane to air mixture for maximum combustion every time. #2 Open valve on propane tank and set pressure regulator to 60 PSI. #3 Open the first Metering Valve or gas valve and wait a few seconds for the pressure to regulate. #4 Close the first valve and quickly snap open the second valve, quickly releasing a shot of propane into the combustion chamber. #6 Close all valves and aim, squeeze the igniter button and BLAMO!!! Tennis ball enters orbit. There is no way I can take the credit for the design you see here. This started off as a special order cannon from Spudtech.com. I was so intrigued by it, I not only felt I needed to own one, but I wanted to contribute to it's design, I wanted to add my contribution to the Spud Gun (or Tennis Ball Gun) world. The design as it was was almost perfect. The only problem was that after firing the gun, all of the oxygen was burned off. In order to launch another ball, one would have to open up the end of the combustion chamber and blow air into it, or let it air out for a few minutes. This was clearly a flaw in the design. So, I mounted a PVC ball valve on the end of the combustion chamber with a 9 volt fan attached. I wired the fan to a box that contains the battery clip, a switch and a flashing LED indicator light. After launching, now all you have to do is open the valve and flip on the Exhaust switch. The burnt exhaust is forced out of the barrel in about 10 - 15 seconds. You can tell the air is fresh by smelling the exhaust coming out of the barrel. Once it is pure air, turn off the exhaust system, close the valve and load her up. PROBLEM SOLVED. After that I created my own aestetic makeover with leather grips, braided gas line, braided strapping, nuker graphics etc. This is the beast that emerged from my workshop. NOTE: There are no blueprints or build sheets available for this gun. I just designed it as I built it. I simply kept improving it over the coarse of a few months. I have no parts lists for it. The truth is I don't think I could build an exact replica if I wanted to. So, please note that I do not have, nor do I sell plans for these guns. This was just a fun little project I did in my spare time. If you need parts or help building a similar model http://www.spudfiles.com/. Those guys know all there is to know about this stuff.